We'll be the first to admit that it was hasty to buy a 28-year old Toyota motorhome from a pot-smoking hippie in San Diego, especially without getting it checked by a mechanic. We'll also admit it felt good to be that dumb and spontaneous. We'd just made some money working in Aspen and we'd been quietly obsessing over Toyota Sunraders for a couple of weeks. We had no real plans of buying a new rig; but this one, an elusive 18 footer, only three hours from where we were staying, looked like a unicorn jumping off the Craigslist page. I think we both blacked out during the buying process. We ignored a lot of red flags and focused on the fantasy of an automatic transmission, a more "modern" car, and a larger, more comfortable two bed life (we've been sharing a bed for 4 months now, and are really tired of waking each other up every time we have to pee). Plus we drove away feeling like independent queens, and that feeling, however fleeting, is worth something. Within an hour it was having trouble starting. The car failed smog when we tried to get it registered, and when we brought it to our trusty friend Uncle Coco to diagnose the problem, he told us the engine was close to death and needed a total overhaul. We spent a couple hours feeling totally defeated -- and then we both had a moment, reminded ourselves how good it felt to be young and dumb, and chose to ride that wave instead. We left the rig at Uncle Coco's, looked for the cheapest plane tickets and warmest weather we could find, and flew to Mexico the next morning. Mexico was everything we wanted it to be. The food was fantastic, the beer cheap, the people overwhelmingly nice to us. We spent most of our time at the taco stands in downtown Puerto Vallarta. The streets are cobblestone and falling apart and dotted with these tiny taco carts, each lined with five or six pots of salsa, cucumbers, and radishes. We found our favorites for 6 pesos each from an old woman who lived behind the stand. We watched her, like salivating dogs, carefully baste the tortillas, top them with chorizo and grilled onions, and pass them to us on colorful plates wrapped in plastic bags. On our first night, we got pulled over in our rental car. We understood enough Spanish to decipher that the cop was writing a ticket for illegally turning out of an express lane. He said I'd be going to "detencion" (jail) if I didn't give him 400 pesos. We tried to tell him we'd pay, in frantic broken Spanish, but he wrote a ticket anyway. We started saying "no comprendo," five or six times, and we must have looked really pathetic because he stopped writing, said "cuidado" and walked away. The trip was made up of these hilariously broken conversations. We'd speak in broken Spanish and the locals responded in broken English. Spanglish. Two people communicating just enough to get by. We drove up through jungle roads into the gorgeous, rugged coastline of Nayarit, to Sayulita and the provincial beach towns that line the coast. Sayulita feels like the Bali of Mexico. It's run amok with white influence and free-spirit tourists, but it's still charming. It's colorful, a little dirty, and strongly energetic. We stood in the street and ate fried tortillas with pork, beef, and cabbage, and then tall cups of fruit basted in salt, lime juice, and crushed chilis. I've had mango with hot sauce in NYC before, but there was something special about this one: layered juicy papaya, jicama, and cucumber, with fresh limes squeezed over it. We immediately bought some Tajin at the grocery store to bring back with us. We fell in love with Lo de Marcos and San Pancho, two small beach towns just north of Sayulita. San Pancho is like a smaller, chiller Sayulita. Lo de Marcos is distinctly provincial, full of run-down corner stores, stray dogs, and empty beaches. I loved it there. We drank Corona on the beach and watched pelicans plummet into the ocean for fish. We walked around the neighborhoods, eyeing all the empty space and real estate, wanting to settle there and open a taco shop, and then quickly feeling like a part of the problem. Lo de Marcos is perfect as it is -- unkempt, beautiful, left alone. We flew back to L.A. to sell the Chinook and pick up the Sunrader, not at all ready to head back to the states -- it was inauguration day and we watched California mourn in record rainstorms. When we headed to the shop to pick up the Sunrader, the engine wasn't done and we slept in Uncle Coco's parking lot for three nights while they finished the job. 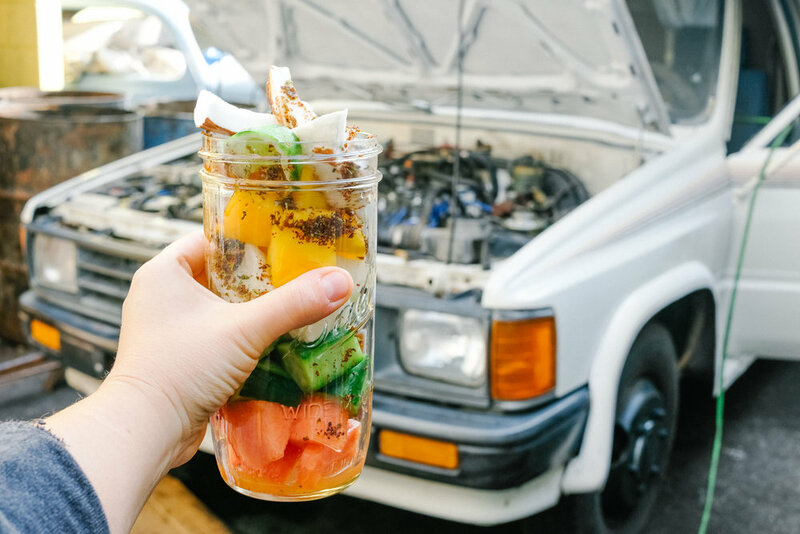 We couldn't stop thinking about the fruit cups we ate in Sayulita, so we made them for breakfast one morning and ate them off the oil cans in the parking lot (van life is just as glamorous as we expected it to be). We had the Tajin with us but we wanted to try to make our own version of it too. We used sumac (it's naturally sour), chili powder, sea salt, and fresh lime zest. You can use pretty much any fruit -- juicy, sturdy fruits like mango and papaya do well, as well as crisp veggies. Oranges or tangerines would be awesome too. Combine sumac, chili, salt, and lime zest in a small bowl and mix well. Arrange cut fruit in a jar, cup, or bowl and sprinkle the chili mixture over the fruit in layers, covering as much fruit as possible. Squeeze 2 limes over each of the servings. The juice will pick up some of the chili mixture and spread it across the rest of the fruit. Let it marinate for a few minutes and enjoy! Notes: You can find sumac at Whole Foods as well as Middle Eastern markets. You can adjust the chili powder to make it more or less spicy. We used New Mexico chili powder, a flavorful one with not a lot of kick.